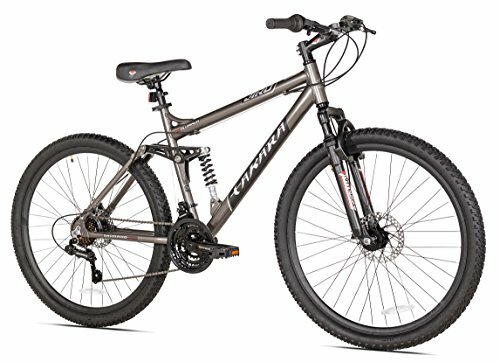 When looking for a mountain bike, there’s an almost overwhelming range of choice. Mountain biking is a great sport and an exciting way to explore the world around you while getting some exercise. You don’t need to break the bank to get involved. A mountain bike is, of course, designed for off-road cycling. You’ll need a bike that can handle itself across a range of terrains. On the whole, this means you’ll be looking for something that is durable without being too heavy. Your tires will be really important as when the terrain is unstable they need to be able to offer enough grip to keep you upright. The wider the tires, the more stable you’ll be. Another essential component of a mountain bike is its suspension. In difficult ground conditions, suspension not only gives you a more comfortable ride but increases your control over the bike. In this article, we’ve looked at ten of the best cheap mountain bikes. We’ve focused on giving you the best value for your money without compromising on quality. For each bike, we’ve explained what makes them a contender and listed their best features. This is a good place to start when thinking about mountain bikes. It is extremely good value but has all the features you need. The frame is made of a durable steel alloy. Additionally, the mountain tires are nice and wide and have great grips, offering good traction on a range of off-road surfaces. There’s an 18-speed gear system which means you can tackle tough climbs. The price is frankly almost unbeatable, and you get a good machine for your money. Front fork suspension offers some cushioning on otherwise bumpy rides. This hybrid bike features a 27.5″ Hi-Ten steel frame. This frame offers excellent strength without being too heavy. The bike has adjustable suspension on the front fork which absorbs vibrations on rough roads. This suspension allows you to ride on tougher tracks with more comfort and control. The bike features a steel bottom bracket with a KMC chain. This is combined with a 21-speed gear system meaning that you’ll be able to tackle steeps hills or extremely muddy terrain. 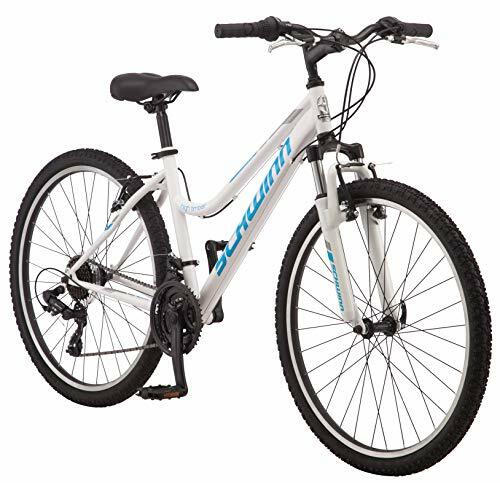 This bike also has mechanical disc brakes on both the front and rear brakes, offering great stopping power in any conditions. This bike sees a slight increase in price. For this, however, you’re offered a wider range of features and higher quality materials. There’s an aluminum alloy frame that is strong without adding too much weight. It also has a single-pivot full suspension system, meaning that you’ll get a lot more cushioning than hardtail bikes. This means it is more suited for those toughest and most demanding trails. The fork on this bike is manufactured by Element. In addition, front and rear disc brakes will mean you have immediate stopping power. There’s a 21-speed gear system, making a good bike for climbing and descending alike. Why We Like It – This mountain bike offers a full suspension system and a lightweight frame. It would be a really good place to start your mountain bike love affair from. It’s an easy and responsive ride. This is another bike with a full suspension. Instead of the single-pivot system on the Mongoose, this bike has a floating bar model. This offers slightly more progressive rear-wheel suspension but is slightly more complicated and a little heavier. The fork offers a reasonable 65mm of travel. The well-balanced frame is made of aluminum, making the bike itself surprisingly lightweight for having full suspension. It has a disc brake at the front and a V-brake on the rear wheel. This offers a good level of braking capacity without making the bike too heavy. It features alloy wheel rims and a 21-speed gear system. A good looking grey and blue color scheme. Why We Like It – This bike has a well-balanced frame that’s easy to control on a range of terrains. The tires are nice and grippy, and it has a great suspension system. This is a well-designed hardtail bike. 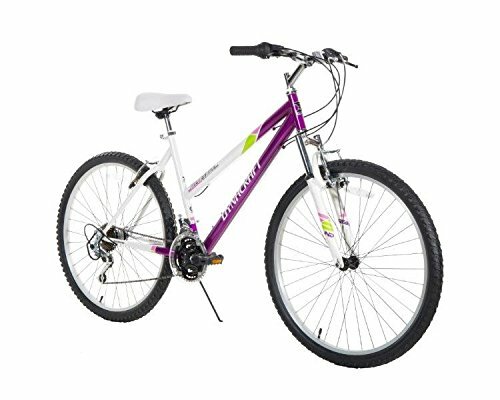 A traditional women’s model, it has a step-through frame design which enables easy mounting and dismounting. The 21-speed gear system gives you decent versatility on slopes and difficult terrain. This might be needed as the steel frame isn’t especially lightweight. This is counterbalanced by not adding too much weight with extra features. The brakes, for example, at the front and rear, are V-brakes, cutting down on some weight. The bike has a front shock fork, offering shock absorption where it matters most. There’s a quick release seat post, allowing a more easy saddle adjustment if you’re sharing the bike. Why We Like It – This is a fairly straightforward women’s mountain bike. It offers comfortable riding at an affordable price. The frame isn’t too heavy, and it is well-suited for light to medium off-road use. 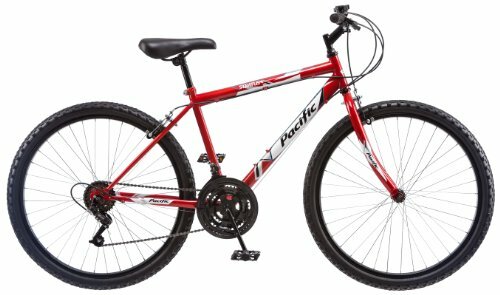 This bike is a surprisingly good value. It includes a full host of features for a great price. The bike is made using 6061 aluminum alloy. It’s an aluminum alloy frequently used on bikes because it has very good strength to weight ratio. The result is that this bike is surprisingly lightweight for what it is. It’ll see you up the sides of hills and ravines quickly. The wheels and tires are big: 27.5″. Their large diameter gives you a greater potential for speed when you’re riding. Their 2.125″ width balances this speed with stability and means that you’ll have a great grip on any surface you’re riding on. 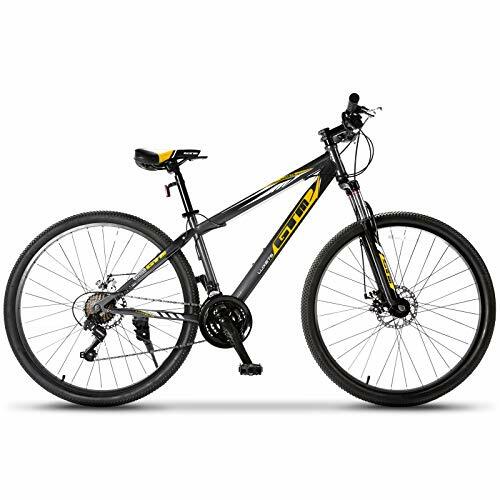 It has a full suspension system (floating bar design) that will offer you good cushioning across rough terrain. It features twist shifters, minimizing weight and providing what is often a more straightforward method of changing gears. It has disc brakes front and rear for maximum braking potential. Why We Like It – The Takara is a great value full suspension mountain bike. It’s got a great aluminum frame that is durable and built to last. It’ll serve as a great way to explore new off-road tracks and trails. 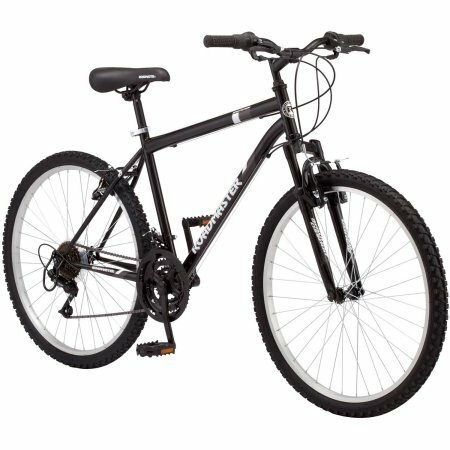 This bike has a sturdy 26″ steel frame at its center. It’s suitable for a range of riders from 5’3″ to 6’2″. It has full suspension: a single-pivot system at the rear and a cushioned fork at the front. The 21-speed gear system is controlled by twist shifters on the handlebars. It has V-brakes at the front and rear which offers reasonable stopping power without adding too much extra weight. The wheels feature alloy rims, and the tires are nice and grippy. In addition, it comes with a deluxe paint job: it has a really striking black and red color scheme that’ll look great on any trail. Why We Like It – A good-looking design at a great price. It comes with a full suspension system that’ll keep you cushioned across a range of difficult terrains. In combination with the tires, this offers an excellent level of stability. This women’s bike is built with a high-tensile steel frame. It has a step-through frame design, making it easier to get on and off, especially for those with limited mobility. It has a comfortable saddle included. 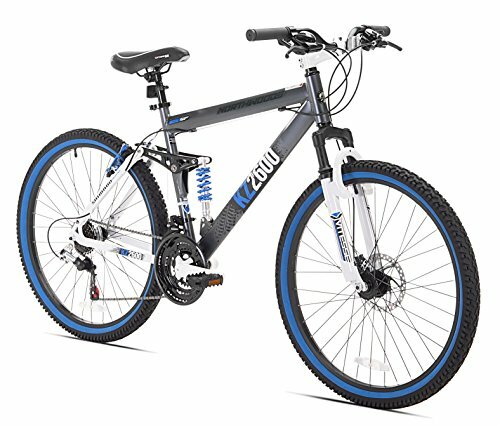 With comfort in mind, it also has a Mojo M30 front suspension fork to help absorb impact. In addition to cushioning for personal convenience, a softer ride almost always makes for better handling. The Schwinn has front and linear V-pull brakes. For gearing, it has a 21-speed system with twist shifters. The front wheel has a quick-release skewer, meaning it can be easily removed and the bike put in the back of your car for easy transportation. It comes in either an elegant white or a striking pink. Why We Like It – A good entry-level women’s mountain bike. If you’re looking for something that’ll get you out on the trails but won’t break the bank, then this bike has all the essential features to start your mountain biking adventure. This is a no-frills steel-framed mountain bike. 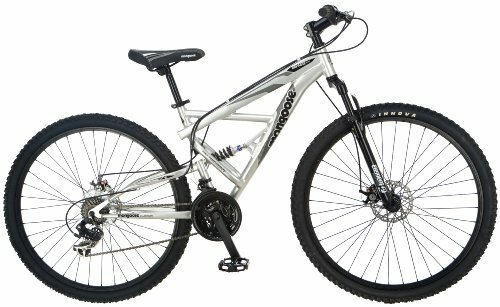 It offers a traditional mountain biking geometry, encouraging an upright sitting position which offers a combination of control and athleticism. There’s a 15-speed gear system, which is a bit less than most of the models we’ve reviewed but plenty for most mountain biking needs. It’s worth noting that this bike doesn’t have any suspension system. This is fine for plenty of off-road trails but, if you’re planning on riding some more challenging and technical tracks, then it might not be suitable. The tires on the Pacific are well treaded and have a good width, offering a nice level of stability. Why We Like It – This is a low-maintenance option that still has a good off-road capacity. It is also great value. If you’re looking for a simple bike to explore some gentler trails then maybe this is the one for you. There’s a lot to think about when choosing your mountain bike. Whether you’re looking at materials or different components, it can be hard to make your mind up. To give you a better sense of what to look for, we’ve analyzed some of the key components of mountain bikes and what kind of usability they offer. It’ll depend on what exactly you want to use your bike for as to what type of bike you’re going to want to buy. The frame is at the heart of any bike. 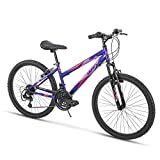 For a mountain bike, the frame needs to be sturdy enough to take a heavy beating across all kinds of off-road terrains. The frames need to be sturdier than those on road bikes because there’ll be more regular, sustained impact. From the bikes we’ve surveyed you’ve got two options: a steel or aluminum alloy. Steel is a very strong material. It’ll offer a very sturdy frame. It is, however, fairly heavy and a steel frame will mean that your bike is fairly heavy. This isn’t necessarily a bad thing. But, if you’re looking to do lots of hill climbing, or you really value your acceleration, then you’re going to feel that extra weight. Aluminum is lighter, but it is a little bit less strong. It is usually considered a higher-grade material, and it is more expensive. It’ll mean you’ve got a much lighter bike which can be extremely useful, depending on what sort of trails you’re planning on riding. If, however, you’re only planning on pounding your bike down downhill rocky tracks, you might not need the lightness, and you’ll probably benefit from the extra strength that steel offers. In terms of frame geometry, mountain bikes offer an upright seating position. This is because you want to see where you’re going and have good control over the handling of the bike. Racing geometry isn’t really required as you won’t reach the speeds where air resistance seems to really matter. On the list are a couple of women’s bike frames. They have a lowered frame bar which traditionally meant that you could mount the bike while wearing a skirt. Now though, women’s frames are very useful for people with limited mobility. They tend to sport different color schemes too. The suspension is another really important thing to consider when buying a mountain bike. If you’re riding off-road, then it’s very likely that you’re going to want some shock absorption. 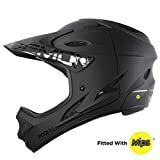 To a certain extent, this is to give you more comfort while riding but also it hugely improves handling, which can get very jumpy on difficult tracks. There are two main options when it comes to choosing suspension: hardtail or a full-suspension system. Or, of course, there are mountain bikes that offer no suspension at all. No suspension mountain bikes are an option. They’re usually lighter and lower maintenance. They’d be suitable if you’re planning on gentle off-road tracks or you want something for commuting. Wide wheels still make them a much more versatile option than road bikes. If, however, you’re planning on tougher, rockier courses, then you’ll find an unsuspended bike starting to struggle. A hardtail bike means that you have suspension on the front wheel but not the back wheel. This can be a really good option because most of the impact goes through the front wheel anyway. It works by having shock absorption in the fork. Usually, this shock absorption is adjustable. It’ll offer you a reasonable level of cushioning across a variety of tracks. It’ll mean a lighter weight bike than if it has a full suspension system and it’ll probably be better valued too. A bike with a full-suspension system will offer you the most cushioning. It does this by attaching the back to the frame using a shock absorption system. It’ll give you a fairly high level of cushioning across all terrains, especially on aggressive downhill tracks with jumps. If you do end up landing on your back wheel: you’ll want back wheel suspension. The easiest way to spot a mountain bike is by looking at the tires. Thick knobby tires are pretty much essential. They’re so crucial because off-road conditions are unstable, and they need a better level grip on the tires. The general rule is, the wider the tires, the more grip you’re going to have. It’s also worth looking at the tread on the tires: some can offer superior handling in wetter or muddier conditions. Of course, mountain bike tires aren’t the fastest, but staying upright is always more important than speed. With the wheels themselves, you also want something very sturdy, especially if you’re planning on heavy usage. A lot of impact goes through the wheels, and you’ll need them to stay true. The most reliable way to a sturdy wheel is having plenty of spokes. So, if you want to pound your bike down lots of downhills, make sure it has plenty of spokes. Another thing to consider when it comes to wheels is size. Larger wheels will give you more potential for speed. Slightly smaller wheels will provide you with more maneuverability and better handling. When it comes to brakes, you have two options: disc brakes or V-brakes/caliper brakes. V-brakes basically grip the edge of the wheel with the brake pads. Disc brakes rely on a braking disc being fitted to the axel, much closer to the center, which braking pads grip to. Essentially, on disc brakes, the pads can be wider and have more stopping power. The other main advantage to disc brakes is that they perform a lot better in adverse weather conditions. With V-brakes, they often require a full revolution of the wheel in order to clear any mud or rain before they start being effective. With disc brakes, you get braking force immediately. Of course, with off-road riding, you’re much more likely to run into muddy conditions. That’s why disc brakes can be a huge advantage. V-brakes are usually better valued. They’re also easy to maintain and lighter weight. If you’re a fair-weather cyclist or planning on being one, then they’re definitely not a bad option. There are bikes on the list that have a combination of both systems: one on the front wheel and one on the back. Gearing is fairly critical for mountain bikes. A good gear system will enable you to climb and get through muddy conditions. 21-speed systems or similar comes as standard on most of the bikes reviewed. They give you a good level of versatility across a range of terrains and profiles. The other thing to bear in mind is the gear changing systems. You’ll be choosing from the more traditional twist shifters or a paddle system. It usually comes down to personal preference. The paddle systems are a newer design, and some people find them a lot easier to use. However, some people think that twist shifters are more straightforward, particularly when climbing. Twist shifters allow you to move quickly through multiple gears. When choosing your mountain bike, you should be thinking about how you’re going to use it. Mountain biking is an extremely varied sport and can mean different things to different people. For some people, it just means getting off the tarmac and away from cars. For this, it can often mean riding round gravel bike tracks or forest paths. If this is what you’re planning on doing, you might not need a bike with elaborate features. If to you, mountain biking means downhill tracks taken at speed, then you’re probably going to want to think more carefully at what features you need. 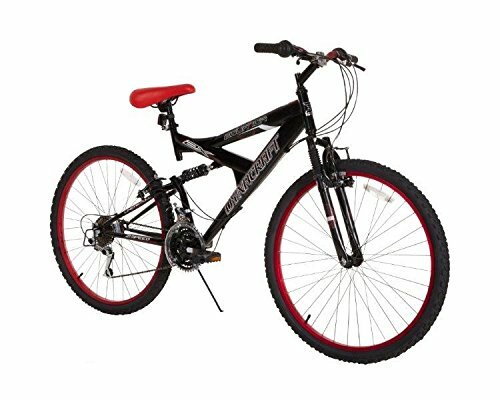 Mountain biking can be dangerous so it’s really important that you have a bike that can suit your needs. If you’re planning on taking your riding seriously, then you’ll want some high-end features. Whatever, your needs, mountain biking is a sport that includes all sorts of people at all kinds of levels: it’ll let you get out and explore your environment in a fun and exciting way.